With the official release of Amazon’s new Kindle 3, there’s suddenly a slew of Kindle 3 reviews cropping up from various website’s around the web. You can find my hands-on Kindle 3 review and video reviews posted on the Kindle 3 review page. Then take a look below at what some of the other reviewers have said about the new Kindle below. The Kindle 3 review at CNet gets 4 out of 5 stars, noting that the Kindle’s numerous upgrades vaults it to the top of the ebook reader market, but the lack of expansion slots and EPUB support, among other things, keeps it from getting a five star rating. Check out their video below. 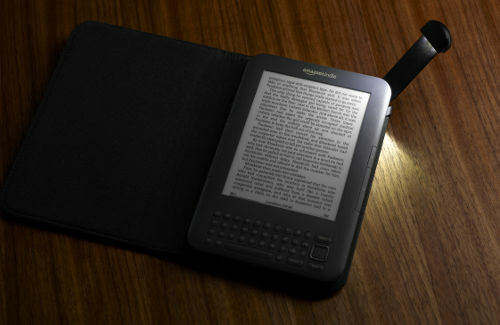 At night, however, you have to have a light source to use the Kindle, which is part of the reason why Amazon has designed an optional protective cover (none ships with the unit) that includes a retracting LED light that’s brilliantly designed. The slim light draws power from the Kindle and tucks away into the case (at first glance, you don’t even know it’s there). The only downside is it’s expensive at $59.99, but we have to say, we really liked it. Wired’s review gives the Kindle 3 a 9 out of 10, saying that “the denser e-ink on the new Kindle is going to make a lot of previous Kindle owners jealous,” and that “Battery life is long enough for space shuttle missions”. What they don’t like is Amazon’s DRM, the lack of a touchscreen, and they say that the interface for newspapers and magazines could use improving. They also mention that the new button layout makes it hard not to accidentally hit the back and menu buttons when moving the cursor up and down. This Kindle 3 is a Triple Wow. Five Stars. Two Thumbs Up. And, because Amazon stays true to its core vision of catalog, convenience and connectivity for the Kindle, it is by far the best ebook reader ever made. For now, and probably for the rest of 2010, at the least. Naturally, as with any other kind of technology, there will be serious people who want no part of it. The Kindle 3 review at PC Mag gets a 4 out of 5 stars. They too like the new higher contrast screen and upgraded features, but really have a problem with Amazon’s locked-in format and lack of EPUB support. With its retail support, custom content, wider file support, and color display, the Barnes and Noble Nook remains a tough contender. But overall, with a lower price, a slimmer, lighter design, higher-contrast screen, and other improvements, the Kindle remains our Editors’ Choice for ebook readers. The Kindle 3 review at PC World is titled “Amazon Kindle 3: The Best Kindle Yet”. While that much would be expected with a next generation device, the reviewer points out that the new trimmed-down design is extremely comfortable to hold for long periods of time and that the new Kindle 3 delivers a more pleasing reading experience than earlier models. The main drawbacks this review mentions is there’s no re-flow mode for PDFs and the bookstore speed was slow in loading book covers and refreshing pages—perhaps a poor 3G connection. From reading all the reviews so far, the Kindle 3 appears to be a hit. All the reviewers like the new added features and the general consensus seems to place the Kindle 3 at the top of the ebook reader list (for now), despite its lack of EPUB support, etc. The biggest selling point seems to be the new low price. You can get a Kindle 3 with free 3G for $189, which is $110 cheaper than the Kindle 2 when it first launched last year, or a Kindle WiFi for $139. Or you can do what I did and get an additional $30 off by signing up for and charging the purchase to an Amazon.com credit card. Here’s the blog post explaining it. I ended up getting a Kindle WiFi for just $109 total.